Est-ce que vos tables de jardin d’intérieur sont conçues trop petites pour des jardins d’intérieur? Souhaitez-vous produire plus dans votre restaurant et offrir des produits frais à vos clients? 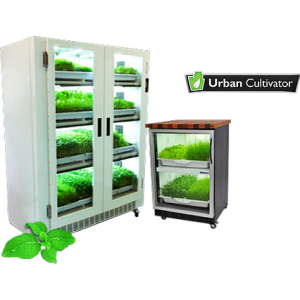 Alors L’urban Cultivator Residential ou Commercial est fait pour vous. Les deux modèles peuvent être connectés au circuit de l’eau de telle sorte que vous n’aurez plus jamais à vous préoccuper de combien et quand vous avez besoin d’arroser vos plantes. 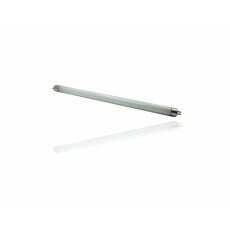 La bonne quantité d’eau et le bon temps de lumière se règlent automatiquement via un panneau intuitif. Grâce à un ventilateur intégré, une humidité et une circulation de l’air optimales sont assurées avec l’Urban Cultivator Residential et Commercial. L’Urban Cultivator a deux modèles. Dans l’UC Residential, 4 plateaux peuvent être placés. Il fait la taille d’un lave-vaisselle standard, facile à intégrer dans votre cuisine. L’UC Commercial peut contenir 16 plateaux et est dédié à une utilisation commerciale telle que pour un restaurant. Urban Cultivator Residential L’Urban Cultivator Residential est fait pour tous ceux qui trouvent que l’AeroGarden n’est pas assez grand. 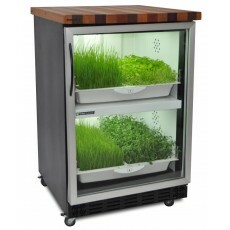 En bref, en achetant l’Urban Cultivator, vous aurez votre propre potager qui vous permettra de cultiver vos herbes et (micro) légumes frais en un tour de main, mais à l’intérieur ! Il n’a jamais été facile de préparer des plats avec de..
Urban Cultivator Commercial Dans le passé, plusieurs restaurateurs nous ont fait la demande d’avoir une variante entièrement automatique dans notre gamme de jardins d’intérieur, mais d’un plus grand format, par conséquent, nous sommes fiers d’introduire l’Urban Cultivator Commercial dans notre offre de jardins d’intérieur. 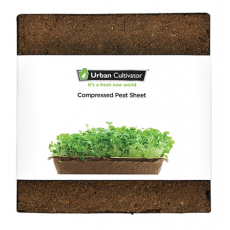 L’Urban Cultivator Commercial, mieux connu sous ..
Grow microgreens using compressed peat sheets, an alternative to soil that makes clean-up easier. 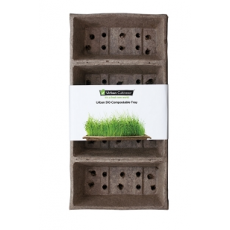 Includes growing material for 4 trays. ..
Soiless growing material, perfect for (but not limited too) plants like Buckwheat, Fenugreek, Lentils, Pea shoots, Sunflower and Wheat grass. 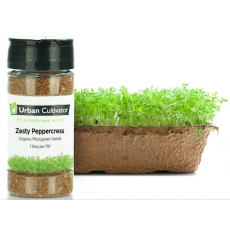 ..
Organic Zesty Peppercress seeds perfected for indoor growing. 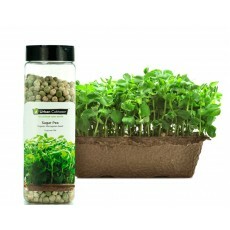 Grows four flats of Zesty Peppercress microgreens. Our seeds are non-GMO, rigorously tested to ensure that they exceed sanitation and contamination standards, and the varieties we offer are carefully and specifically selected for Urban Cultivator appliances. 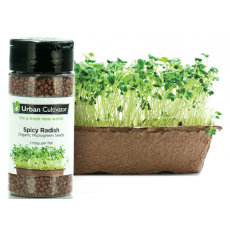 The aptly named peppercress—known for its spicy kick—..
Organic Bright Basil seeds perfected for indoor growing. 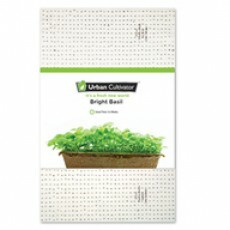 Grows four flats of Bright Basil microgreens. Our seeds are non-GMO, rigorously tested to ensure that they exceed sanitation and contamination standards, and the varieties we offer are carefully and specifically selected for Urban Cultivator appliances. The name "basil" is derived from the Greek word for king or roy..
Organic Crisp Lettuce seeds perfected for indoor growing. 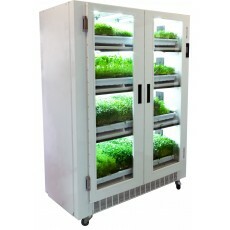 Grows four flats of Crisp Lettuce microgreens. Our seeds are non-GMO, rigorously tested to ensure that they exceed sanitation and contamination standards, and the varieties we offer are carefully and specifically selected for Urban Cultivator appliances. Lettuce is one of the most commonly grown vegetables in the w..
Organic Fragrant Cilantro Seeds Perfect for Indoor Growing. Grow four flats of Fragrant Cilantro. Our seeds are non-GMO, rigorously tested to ensure that they exceed sanitation and contamination standards, and the varieties we offer are carefully and specifically selected for Urban Cultivator appliances. Cilantro is high in: Vitamin A, C, K, beta carotene, folic acid, potassium..
Organic Malt Amaranth seeds perfected for indoor growing. 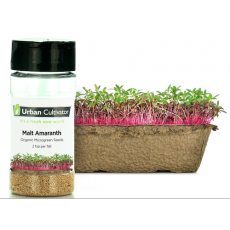 Grows four flats of Malt Amaranth microgreens. Our seeds are non-GMO, rigorously tested to ensure that they exceed sanitation and contamination standards, and the varieties we offer are carefully and specifically selected for Urban Cultivator appliances. The nutty ancient seed is similar to quinoa, and just like qu..
Sharp, spicy, bright, and gorgeous, mizuna, or Brassica rapa nipposinica, is a cook's dream. It holds a distinct flavor profile, and is one of the most interesting greens around. While not extremely prevalent in North America, mizuna is a staple vegetable in many Asian countries. 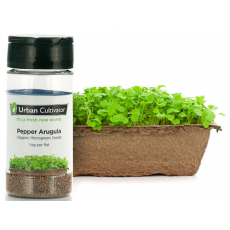 Mizuna is also known as Japanese mustard, shui cai (or "water greens"), California peppergrass, ..
Organic Sharp Mustard seeds perfected for indoor growing. 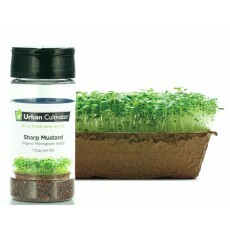 Grows four flats of Sharp Mustard microgreens. Our seeds are non-GMO, rigorously tested to ensure that they exceed sanitation and contamination standards, and the varieties we offer are carefully and specifically selected for Urban Cultivator appliances. Mustard is an easy-to-grow green with a bite. This is the sam..
Organic Sugar Pea seeds perfected for indoor growing. Grows four flats of Sugar Pea microgreens. Our seeds are non-GMO, rigorously tested to ensure that they exceed sanitation and contamination standards, and the varieties we offer are carefully and specifically selected for Urban Cultivator appliances. These lush, crisp peashoots taste exactly like fresh snap peas—except..
Organic Sweet Wheatgrass seeds perfected for indoor growing. 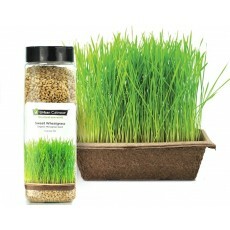 Grows four flats of Sweet Wheatgrass. Our seeds are non-GMO, rigorously tested to ensure that they exceed sanitation and contamination standards, and the varieties we offer are carefully and specifically selected for Urban Cultivator appliances. Wheatgrass helps your body build red blood cells, which carry oxyge..
Organic Tangy Lemon Balm seeds perfected for indoor growing. 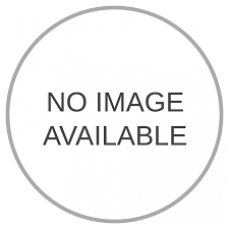 Grows four flats of Tangy Lemon Balm microgreens. Our seeds are non-GMO, rigorously tested to ensure that they exceed sanitation and contamination standards, and the varieties we offer are carefully and specifically selected for Urban Cultivator appliances. The hint is in its name; lemon balm, or Melissa officin..
Organic Umami Savory seeds perfected for indoor growing. Grows four flats of Umami Savory microgreens. Our seeds are non-GMO, rigorously tested to ensure that they exceed sanitation and contamination standards, and the varieties we offer are carefully and specifically selected for Urban Cultivator appliances. The leaves of savory have somewhat peppery flavor with a minty ..
Organic Pepper Arugula seeds perfected for indoor growing. 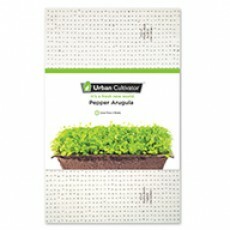 Grows four flats of Pepper Arugula microgreens. Our seeds are non-GMO, rigorously tested to ensure that they exceed sanitation and contamination standards, and the varieties we offer are carefully and specifically selected for Urban Cultivator appliances. Arugula is a leafy green herb of the mustard family. Also k..
Organic Amber Pea seeds perfected for indoor growing. Grows four flats of Amber Pea microgreens. Our seeds are non-GMO, rigorously tested to ensure that they exceed sanitation and contamination standards, and the varieties we offer are carefully and specifically selected for Urban Cultivator appliances. These lush, crisp peashoots taste exactly like fresh snap peas—except..
Organic Licorice Shiso seeds perfected for indoor growing. 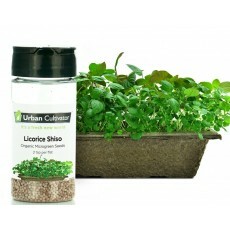 Grows four flats of Licorice Shiso microgreens. Our seeds are non-GMO, rigorously tested to ensure that they exceed sanitation and contamination standards, and the varieties we offer are carefully and specifically selected for Urban Cultivator appliances. Shiso isn't very common in Western cooking, but in the worl.. 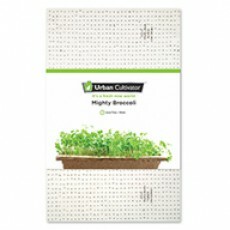 Description Organic Mighty Broccoli seeds perfected for indoor growing. 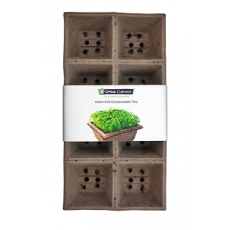 Grows four flats of Might Broccoli microgreens. Our seeds are non-GMO, rigorously tested to ensure that they exceed sanitation and contamination standards, and the varieties we offer are carefully and specifically selected for Urban Cultivator appliances. Broccoli microgreens are not only tasty..
Organic Winter Thyme seeds perfected for indoor growing. Grows four flats of Winter Thyme seeds. Our seeds are non-GMO, rigorously tested to ensure that they exceed sanitation and contamination standards, and the varieties we offer are carefully and specifically selected for Urban Cultivator appliances. Winter Thyme tastes like cloves. Try it in linguine with lemon and garlic. ..
Organic Ruby Veined Sorrel seeds perfected for indoor growing. Grows four flats of Ruby Veined Sorrel microgreens. Our seeds are non-GMO, rigorously tested to ensure that they exceed sanitation and contamination standards, and the varieties we offer are carefully and specifically selected for Urban Cultivator appliances. Sorrel is grown for its tangy, slightly-sour tastin..
Organic Robust Lentils seeds perfected for indoor growing. 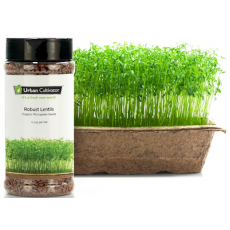 Grows four flats of Robust Lentil microgreens. Our seeds are non-GMO, rigorously tested to ensure that they exceed sanitation and contamination standards, and the varieties we offer are carefully and specifically selected for Urban Cultivator appliances. They’re known for being in delicious curries, but lentils in..
Organic Wild Oregano seeds perfected for indoor growing. Grows four flats of Oregano seeds. Our seeds are non-GMO, rigorously tested to ensure that they exceed sanitation and contamination standards, and the varieties we offer are carefully and specifically selected for Urban Cultivator appliances. Oregano is high in vitamin K and manganese. It tastes like balsamic vinegar, and..
Organic Fresh Parsley seeds perfected for indoor growing. Grows four flats of Fresh Parsley microgreens. Our seeds are non-GMO, rigorously tested to ensure that they exceed sanitation and contamination standards, and the varieties we offer are carefully and specifically selected for Urban Cultivator appliances. Parsley is widely used around the globe to season meats, soup..
Organic Earthy Komatsuna seeds perfected for indoor growing. 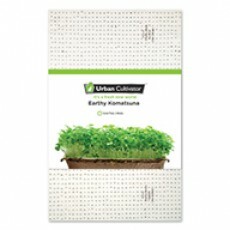 Grows four flats of Earth Komatsuna microgreens. Our seeds are non-GMO, rigorously tested to ensure that they exceed sanitation and contamination standards, and the varieties we offer are carefully and specifically selected for Urban Cultivator appliances. These tender, rich leaves are often referred to mustard ..
Organic Power Kale seeds perfected for indoor growing. Grows four flats of Power Kale microgreens. Our seeds are non-GMO, rigorously tested to ensure that they exceed sanitation and contamination standards, and the varieties we offer are carefully and specifically selected for Urban Cultivator appliances. Kale, also known as borecole, is one of the healthiest and most pop..
Organic Citrus Dill seeds perfected for indoor growing. Grows four flats of Citrus Dill microgreens. Our seeds are non-GMO, rigorously tested to ensure that they exceed sanitation and contamination standards, and the varieties we offer are carefully and specifically selected for Urban Cultivator appliances. This annual herb grows up to a height of about three feet and has..
Organic Nutty Flax seeds perfected for indoor growing. 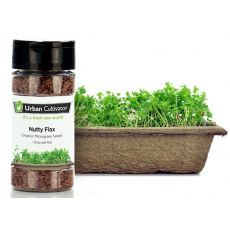 Grows four flats of Nutty Flax microgreens. Our seeds are non-GMO, rigorously tested to ensure that they exceed sanitation and contamination standards, and the varieties we offer are carefully and specifically selected for Urban Cultivator appliances. Flax seeds are everywhere and used in many health-conscious recipes..
Organic Maple Fenugreek seeds perfected for indoor growing. 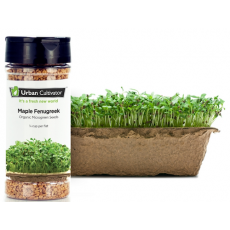 Grows four flats of Maple Fenugreek microgreens. Our seeds are non-GMO, rigorously tested to ensure that they exceed sanitation and contamination standards, and the varieties we offer are carefully and specifically selected for Urban Cultivator appliances. Fenugreek, or faenugraecum in Latin, which means "Greek h..
Organic Spicy Radish seeds perfected for indoor growing. 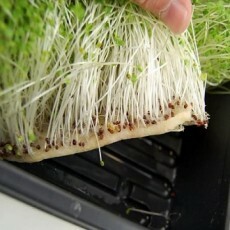 Grow four flats of Spicy Radish microgreens. Our seeds are non-GMO, rigorously tested to ensure that they exceed sanitation and contamination standards, and the varieties we offer are carefully and specifically selected for Urban Cultivator appliances. If you love radishes, then you will love radish sprouts and micr..
Organic Crunchy Cabbage seeds perfected for indoor growing. Grows four flats of Crunchy Cabbage microgreens. Our seeds are non-GMO, rigorously tested to ensure that they exceed sanitation and contamination standards, and the varieties we offer are carefully and specifically selected for Urban Cultivator appliances. 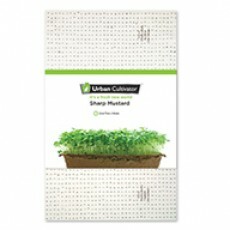 Cabbage is one of the most ubiquitous vegetables, and it ..
Organic Delicate Chervil seeds perfected for indoor growing. 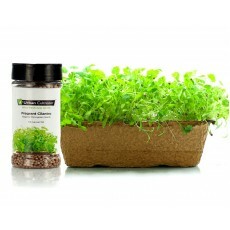 Grows four flats of Delicate Chervil microgreens. Our seeds are non-GMO, rigorously tested to ensure that they exceed sanitation and contamination standards, and the varieties we offer are carefully and specifically selected for Urban Cultivator appliances. Chervil's uncanny resemblance to flat-leaf parsley may ..
With Urban Cultivators seed sheets preparing your trays becomes even easier. Simply put the sheet on top of the compressed peat or soil and set the machine to water manually. 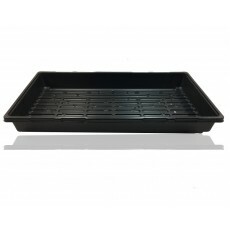 Includes: 3 sheets ..
Tray Liners are recommended for the Commercial Cultivator to prevent loose soil from flowing into the reservoir and plumbing. 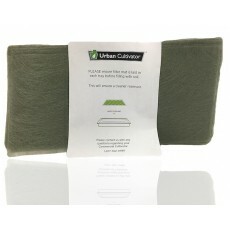 ***The Tray Liners are not required for the Residential Cultivator. ..